Equip you and your whole family for thrilling adventures with the 2019 Nissan Pathfinder. This spacious three-row SUV offers smooth driving, powerful capability, and refined comfort for both daily driving and outdoor getaways. The 2019 Nissan Pathfinder is here at Universal Nissan as part of our selection of new Nissan vehicles. Head over to our Orlando Nissan dealership today to test drive the Nissan Pathfinder and to experience all it has to offer in person. 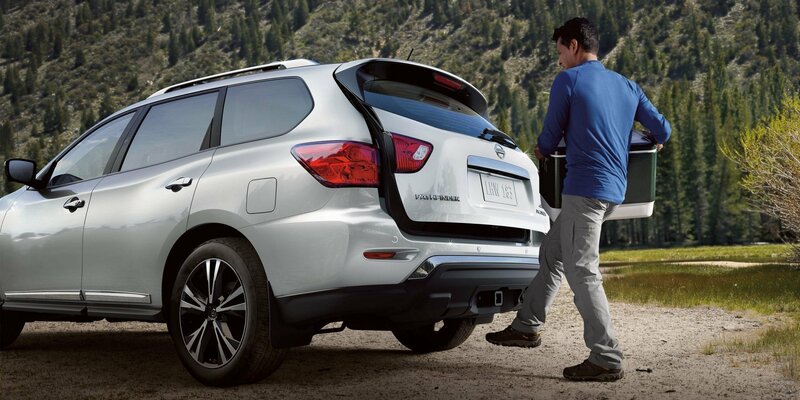 Offering spacious seating for up to seven passengers and 16.2 cubic feet of cargo space, the Nissan Pathfinder was built to go on exciting adventures, without leaving anyone or anything behind. With both the second and third row flat, you’re looking at a maximum 79.5 cubic feet of storage room to utilize. Sleek styling can be found inside and out, and the spacious cabin acts as a welcomed escape from the elements, thanks to the use of high-quality materials and artistic design. The expertly engineered suspension helps deliver a smooth ride and sharp handling, both on the road and on the trail. Available four-wheel drive ensures confident excursions no matter what the road ahead may have in store. While you taking on different types of terrain, you can select various modes to get ideal traction for the path ahead, and hill start assist helps prevent you from rolling back when you start heading uphill, giving you great control over your driving. The Nissan Pathfinder is powered by a hearty 3.5-liter V6 engine, which churns out 284 horsepower and 259 lb-ft of torque. This power, along with the high-strength body frame, allows the Nissan Pathfinder to tow up to 6,000 lb. We feel confident that the Nissan Pathfinder near Kissimmee, FL will help keep you safe both day and night. It comes available with several advanced driver-assist systems that help you avoid accidents on the open road. One such feature is the emergency braking system, which automatically applies the brakes in the event an impending accident is detected. Amenities like blind spot warning and rear cross traffic alert are also offered. The sleek infotainment display and user interface is made even more convenient by its compatibility with Amazon Alexa™ and Google Assistant, allowing you to access your favorite media apps by using voice command. Available is the tri-zone entertainment system, which comprises dual eight-inch head restraint-mounted monitors, a remote control, and two wireless headphones. When you visit our Nissan dealership in Orlando, located at 12785 S. Orange Blossom Trail, you will be met with great customer service from start to finish. Head over to our dealership today to discover your next great adventure SUV and inquire about your Nissan auto finance eligibility.